A 40-year-old with a history of recurrent patellar dislocation resulting in post-traumatic patellofemoral chondromalacia has persistent anterior knee pain and swelling 2 years after patellofemoral chondroplasty and synovectomy. Will fresh osteochondral allograft transplantation offer pain relief? A 40-year-old male presented with persistent left anterior knee pain and swelling 2 years post-arthroscopic patellofemoral chondroplasty, subtotal synovectomy, and synovial biopsy revealing mild-to-moderate chronic synovitis. He reported that the pain, which varied in severity from 3/10 to 7/10, significantly limited his work as well as activities of daily living and sometimes necessitated taking hydrocodone at night so he could sleep. He also reported a sense of insecurity with certain motions and positions of his left knee, particularly when negotiating stairs. The patient’s history was significant for recurrent lateral patellar dislocation and subluxation. He sustained an initial injury to his left knee 20 years earlier resulting in acute lateral patellar dislocation. Following this injury, the patient had mild intermittent discomfort and modified his activity to some degree. Three years ago, he experienced a repeat dislocation followed by a second repeat dislocation approximately 1 month later. The patient was initially treated conservatively, which included activity modification, rehabilitation, intra-articular corticosteroid and viscosupplementation injections, and a lateral J knee sleeve. However, the patient’s discomfort persisted and he subsequently opted for diagnostic knee arthroscopy. During his initial left knee arthroscopic surgery, the patient was found to have severe grade IV post-traumatic arthritis affecting the majority of his patella articular surface and the lateral half of his trochlea. In addition, there was evidence of a diffuse synovial process; a synovial biopsy was positive for pigmented villonodular synovitis (PVNS). The patient was referred to a total joint specialist for consideration of patellofemoral replacement. Due to the abnormal synovium and his relatively young age, he was not found to be an appropriate candidate. Figures 1-2. Preoperative lateral radiograph of the left knee (left) demonstrates degeneration of the lateral patellofemoral articulation and patella alta. Preoperative sunrise radiograph of the left knee (right) demonstrates degeneration of the patellofemoral articulation and lateral tracking of the patella. MRI scan of the left knee demonstrated grade IV posttraumatic changes affecting the lateral patellofemoral articulation as well as a subchondral cyst (Figure 3). Both valgus alignment and a mildly elevated tibial tuberosity-trochlear groove (TT-TG) distance were also noted, using a distance of < 15 mm as the normal TT-TG reference value. Figure 3. Preoperative sagittal T1- and T2-weighted images of the left knee demonstrate grade IV patellofemoral cartilage degeneration and a subchondral cyst. 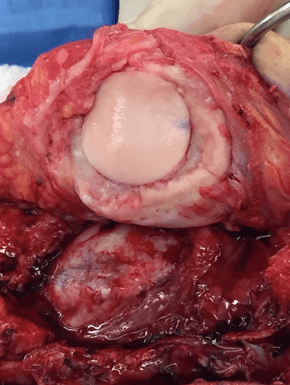 The patient underwent fresh osteochondral allograft transplantation of the patella and lateral trochlea with medialization tibial tubercle osteotomy, Z-plasty lengthening of the lateral retinaculum, and anterior compartment fasciotomy. The patient was placed supine under general anesthesia. Using a bolster, his left lower extremity was placed in a neutral position, and a well-padded tourniquet was placed on his proximal thigh. Z-plasty lengthening was used to perform the lateral parapatellar arthrotomy. An incision was made through the superficial lateral retinacular layers adjacent to the patella and extending proximally into the distal quadriceps tendon and distally along the lateral border of the patellar tendon. An anterior compartment fasciotomy was performed using Bovie electrocautery, with the anterior compartment musculature dissected posteriorly about 1 cm with a Cobb elevator. 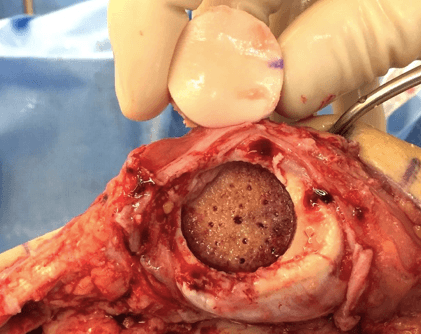 A tibial tubercle osteotomy was performed using an AO 2.5-mm drill bit passed from proximal lateral to distal medial just posterior to the anterior tibial cortex. These holes were connected with a half-inch Lambotte osteotome to perform the osteotomy while keeping the distal periosteal hinge intact. Once it was able to be plastically deformed medially, where the proximal end was pushed medially approximately 15 mm, it was provisionally fixed with a smooth K-wire. The patella was everted and marked. Post-traumatic grade IV changes were noted along the majority of the patella articular surface (except the superomedial portion) and the lateral half of the trochlea (Figure 4). Once the sizing block was positioned on the lateral facet of the patella, the perpendicular guide pin was drilled. The trephine was placed over it, and the reamer was used to ream to the appropriate depth (approximately 6 mm). Next, the 22.5-mm patellar allograft was placed on the cutting jig and, once the cylindrical reaming hole was properly positioned, the donor graft drill was passed through the patella after marking the 12 o’clock position. The graft was then trimmed to the appropriate thickness, and the bony portions of the graft were smoothed with a rongeur (Figure 5). Grafton and allograft chips were used to achieve the appropriate height of the graft resulting in a secure fit. The patella osteochondral allograft was gently press-fit into place and settled to the appropriate depth (Figure 6). Two 18-mm trochlear allografts were prepared for the trochlear lesion in a similar fashion to the technique outlined above. The sizing block was placed perpendicular to the lesion, the guide pin was advanced, the trephine was placed over it, and the reamer was used to ream to the appropriate depth. The femoral condyle osteochondral allograft was placed on the cutting jig and proper positioning of the harvesting reamer was used to obtain the 18-mm diameter graft, followed by trimming to the appropriate depth and smoothening with a rongeur before the graft was press-fit into place. A second plug was placed in a similar fashion distal to the first without overlap (Figure 7). The Z-plasty lengthening was reapproximated by suturing the more lateral superficial layer to the deeper medial layer, and approximately 2 cm of lengthening was achieved. The distal quadriceps tendon that had been opened in its midline was reapproximated with #2 FiberWire sutures in a figure-of-eight fashion. Distally, the tibial tubercle osteotomy was secured with two AO 3.5-mm screws. Figure 4. 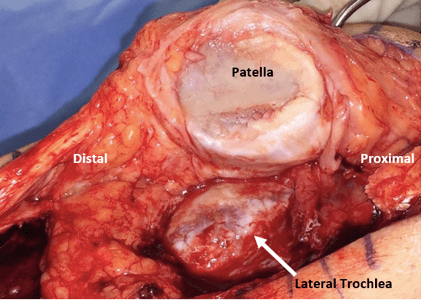 Intraoperative photograph of the left knee following lateral parapatellar arthrotomy demonstrates grade IV post-traumatic changes affecting the patella and lateral trochlea. Figure 5. Intraoperative photograph of the size-matched patellar osteochondral allograft following harvest of the donor plug alongside the recipient’s patella after reaming. Figure 6. Intraoperative photograph of the recipient’s patella after press-fitting the donor osteochondral allograft into the reamed area. Figure 7. Intraoperative photograph of the recipient’s patella and lateral trochlea after the donor osteochondral allografts were press-fit into the reamed areas. Immediately following surgery, the patient was placed in a knee brace locked in full extension. Partial weight-bearing with crutches was allowed initially (50% at 0-2 weeks, 75% at 3 weeks), and full weight-bearing was allowed at 4 weeks. Early range of motion of the knee (0-45°) was allowed for the first 3 weeks, followed by 0-90° by 6 weeks and then progression to full range of motion as tolerated. The brace was discontinued at 4 months. At the 4-month follow-up, the patient stated that he was “feeling great overall” and reported sleeping well and not using any pain medication. Range of motion was 5-125° with minimal pain. Trace patellofemoral crepitation was detected with active knee extension. Many autologous chondrocyte implantation procedures are currently performed in 2 stages to allow for cell culture, which is costly and necessitates additional recovery time. In general, these procedures are most appropriate for younger patients with acute, full-thickness osteochondral lesions. Moreover, given the advanced degenerative changes noted in this patient, ACI/MACI procedures were not considered to be appropriate treatment options. When used to treat post-traumatic arthritis, OCA transplantation may delay or eliminate the need for future knee arthroplasty, which is an important consideration for young, active patients. The graft matching and procurement process is complex, as it entails ensuring that the harvested donor graft matches the size, shape, and precise location of the defect. The mediolateral dimension of the tibia is used for sizing. Moreover, once a match is found, the graft must undergo processing and serologic testing. In addition to being technically demanding, this procedure is associated with significant costs. Unfortunately, the use of fresh osteochondral allografts for bipolar patellofemoral lesions may not be covered by some insurance companies. 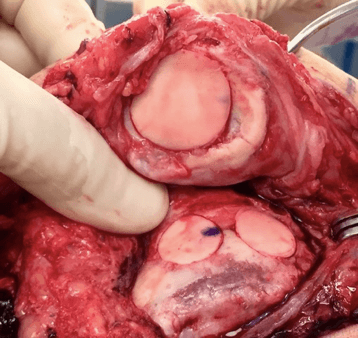 However, with proper indications and documentation of failed conservative treatment, the senior author has not experienced issues obtaining approval for fresh OCA transplantation as a salvage procedure. Although fresh OCA transplantation may be an effective procedure for treating patellofemoral chondral lesions, there is a need for further research on long-term outcomes as well as optimization of graft viability and healing. Zaira Chaudhry, MPH, and Robert W. Frederick, MD, are from The Rothman Institute, Philadelphia, Pennsylvania. Outerbridge RE, Dunlop JA. The problem of chondromalacia patellae. Clin Orthop Relat Res. 1975;110:177–196. Yanke AB, Wuerz T, Saltzman BM, Butty D, Cole BJ. Management of patellofemoral chondral injury. Clin Sports Med. 2014 Jul;33(3):477-500. Curl WW, Krome J, Gordon ES, et al. Cartilage injuries: a review of 31,516 knee arthroscopies. Arthroscopy. 1997;13(4):456–460. Hjelle K, Solheim E, Strand T, et al. Articular cartilage defects in 1,000 knee arthroscopies. Arthroscopy. 2002;18(7):730–734. Nomura E, Inoue M, Kurimura M. Chondral and osteochondral injuries associated with acute patellar dislocation. Arthroscopy. 2003 Sep;19(7):717-21. Quilty B, Tucker M, Campbell R, Dieppe P. Physiotherapy, including quadriceps exercises and patellar taping, for knee osteoarthritis with predominant patello-femoral joint involvement: randomized controlled trial. J Rheumatol. 2003 Jun;30(6):1311-7. Gobbi A, Kon E, Berruto M, et al. Patellofemoral full-thickness chondral defects treated with second-generation autologous chondrocyte implantation: results at 5 years’ follow-up. Am J Sports Med. 2009 Jun;37(6):1083-92. Sherman SL, Garrity J, Bauer K, Cook J, Stannard J, Bugbee W. Fresh osteochondral allograft transplantation for the knee: current concepts. J Am Acad Orthop Surg. 2014 Feb;22(2):121-33. Bugbee WD, Pallante-Kichura AL, Görtz S, Amiel D, Sah R. Osteochondral allograft transplantation in cartilage repair: graft storage paradigm, translational models, and clinical applications. J Orthop Res. 2016 Jan;34(1):31-8. Jamali AA, Emmerson BC, Chung C, Convery FR, Bugbee WD. Fresh osteochondral allografts: Results in the patellofemoral joint. Clin Orthop Relat Res. 2005;437:176-185. Torga Spak R, Teitge RA. Fresh osteochondral allografts for patellofemoral arthritis: Long-term followup. Clin Orthop Relat Res. 2006; 444:193-200.